Racetril Capsule: Each capsule contains Racecadotril BP 100 mg.
Racetril 10: Each sachet contains Racecadotril BP 10 mg granules for oral suspension. 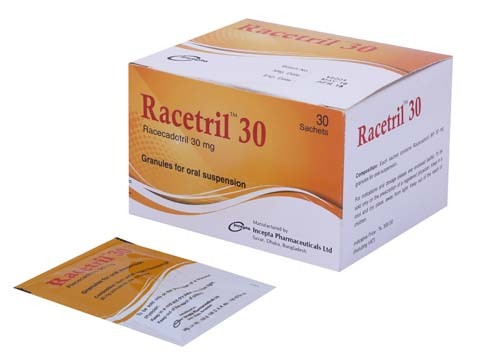 Racetril 30: Each sachet contains Racecadotril BP 30 mg granules for oral suspension. 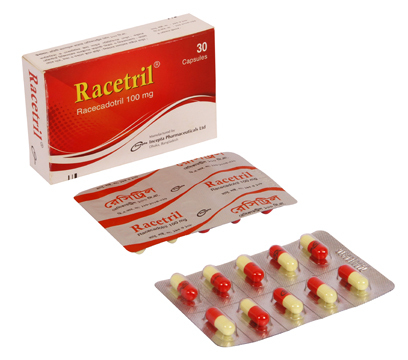 Racecadotril is a pure intestinal antisecretory active substance. It decreases the intestinal hypersecretion of water and electrolytes induced by cholera toxin or inflammation and does not have effects on basal secretory activity. Following oral administration, Racecadotril is rapidly absorbed and then hydrolysed to thiorphan, which is an inhibitor of enkephalinase, a cell membrane peptidase located in various tissues, notably the epithelium of the small intestine. This enzyme contributes both to the hydrolysis of exogenous peptides and to the breakdown of endogenous peptides such as enkephalins. Racecadotril protects enkephalins from enzymatic degradation thereby prolonging their action at enkephalinergic synapses in the small intestine and reducing hypersecretion. Racecadotril exerts rapid antidiarrhoeal action, without modifying the duration of intestinal transit. Racecadotril is indicated for the symptomatic treatment of acute diarrhea. Adults: One capsule initially, regardless of the time of day. Then one capsule three times daily preferably before the main meals. Children (from 3 months of age): Racecadotril granules should be administered together with oral rehydration. The recommended dose is determined according to body weight: 1.5 mg/kg per administration, three times daily. Infants less than 9kg: one 10 mg sachet 3 times daily. Infants from 9 kg to 13 kg: two 10 mg sachets 3 times daily. Children from 13 kg to 27 kg: one 30mg sachet 3 times daily. Children of more than 27 kg: two 30mg sachets 3 times daily. Headache, erythema multiforme, urticaria, angioedema may be seen. The administration of Racecadotril does not modify the usual rehydration regimens. The presence of bloody stools and fever may indicate the presence of invasive bacteria as a reason for diarrhea or the presence of other severe disease. Racecadotril has not been tested in antibiotic-associated diarrhea and should therefore not be administered under these conditions. Caution should be taken in patients with renal or liver impairment. Due to a lack of clinical data, Racecadotril should not be administered to pregnant or breastfeeding women.